Metin Gurcan, PhD, develops computerized image analysis tools and methods to enhance medical diagnostics. 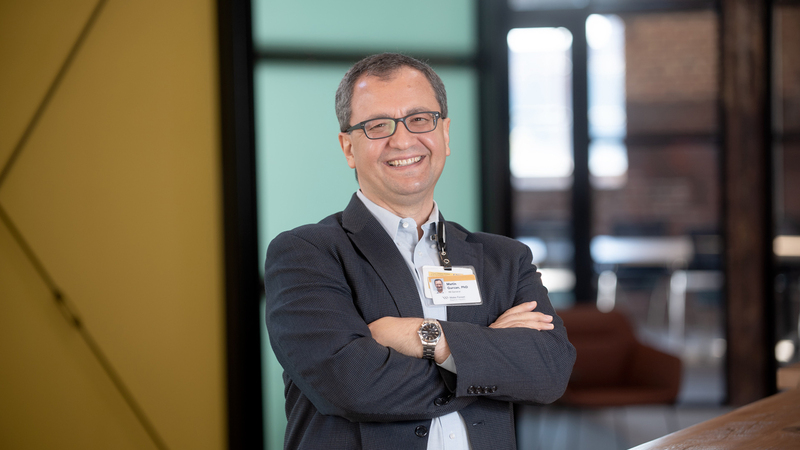 He believes that research partnerships will advance biomedical informatics and will help turn his ideas and solutions into products that will make a difference in patients’ lives. Originally trained as an electrical and electronics engineer, Gurcan earned his PhD in 1999 at Bilkent University in his native Turkey, followed by postdoctoral training in radiology at the University of Michigan in 2001. After working for a high-tech company as a senior researcher and product director, he joined The Ohio State University Department of Biomedical Informatics in 2005, where he progressed from assistant professor to associate professor to full professor. In 2017, he joined Wake Forest School of Medicine as director of the Center for Biomedical Informatics. Gurcan’s research interests concentrate on image analysis and computer vision with applications to medicine. His current projects include computerized analysis of large, complex medical images, analysis of the tumor microenvironment in follicular lymphoma, digital otoscopy to aid diagnosis of ear infections and computerized quantification of histopathological images. The technologies he is developing are designed to advance diagnostic accuracy, reducing false positives and false negatives. Gurcan holds three patents for his inventions in computer-aided image analysis and has authored more than 150 peer-reviewed publications. The cross-disciplinary Center for Biomedical Informatics is intended to integrate Wake Forest resources to advance and promote informatics research, practice and education. Having lost several loved ones to cancer, Gurcan is devoted to contributing to improved detection and diagnosis of the disease, bettering the accuracy of decision-making that emerges from analysis of medical imaging. For example, he and his team are developing tools and techniques to quantitatively analyze histopathological images, which may require doctors to laboriously count certain types of cells on large images. By automating the process while enhancing accuracy, physicians will be freed to concentrate on the many decisions faced in cancer treatment. Gurcan believes that industry collaborations can reap profound benefits to the patient population by effectively turning discoveries in labs to tools and products to benefit patients. He seeks to help partners with their projects involving medical image analysis, computer vision and artificial intelligence, while seeing his group’s ideas turned into beneficial products through commercialization and entrepreneurship. Ultimately, the Center’s research group is eager to collaborate with partners in the computerized analysis of large, complex medical images, elucidation of tumor microenvironments, development of intelligent and accurate analysis methods for histopathological, radiological and photographic images, and videos. Access medical research services for your preclinical and clinical needs through Wake Forest Innovations, your industry gateway to Wake Forest Baptist Medical Center.